ilovefuzz.com • View topic - Let's see your DRUMS! 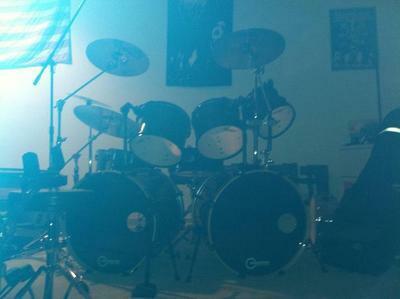 Re: Let's see your DRUMS! Not my set but my buddies set. Metaaaaal! This is all I'm sporting at the moment. 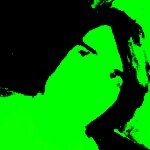 Not much, but I'm a guitarist and songwriter mainly. ZBT hats, B8 22 ride, B8 18 crash, and yeah that's it. Oldschool Premier, 60's from what I can gather. 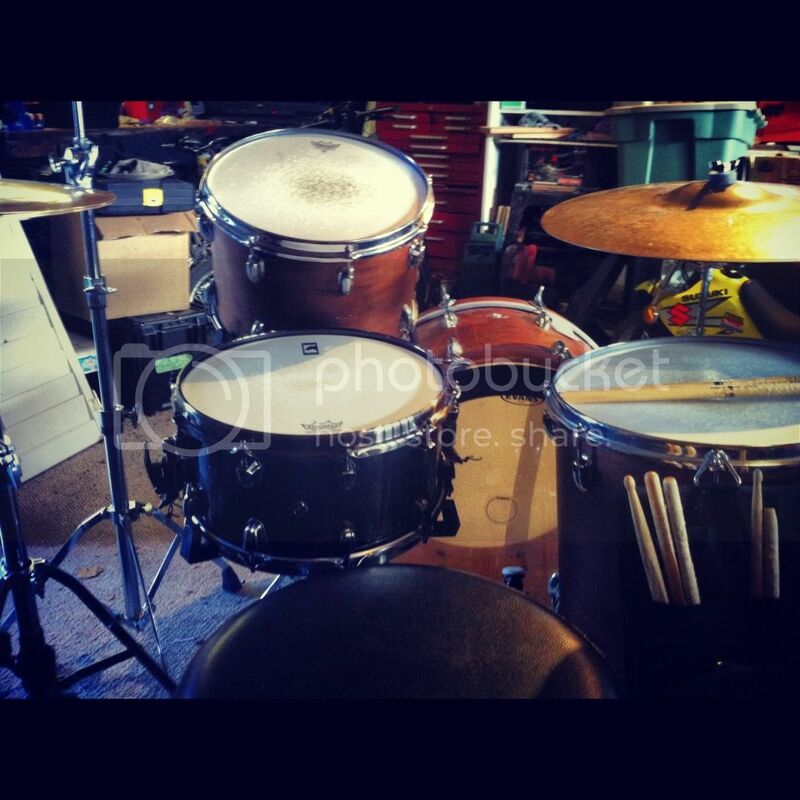 I don't really play a lot of drums these days. Guitar and bass take up the bulk of my time at the moment but I still like to dabble. DAT BELL! Mega Love that natural wood too! Cheers, I'm ma sucker for natural wood finishes. This kit was lavender when I first got it so my first point of order was to strip it, sand it, give it a light stain and done. I"d love to find some bottom hoops for it though. I got a Agazarian 12in. 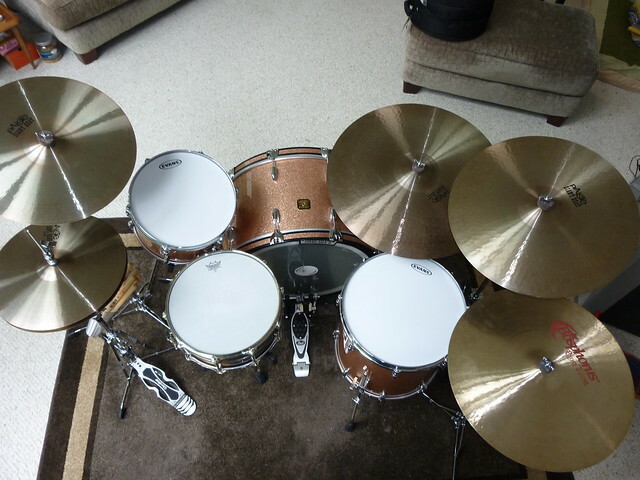 china for my birthday, you can seee it next to my ride cymbal, also I got about 3 months ago a Zildjian 12in. A splash, it's aight as in okay but I'd sell it with a second thought cuz it's only aight. "The future is the past not yet written!" I've been give a mint condition (never been played) Premier marching snare from what I what say from the slot head lugs, dates back to the 60's. Trying to suss out a stand so I can mount it on my kit. I'm thinking something like the Pearl S-1000D might be my match. 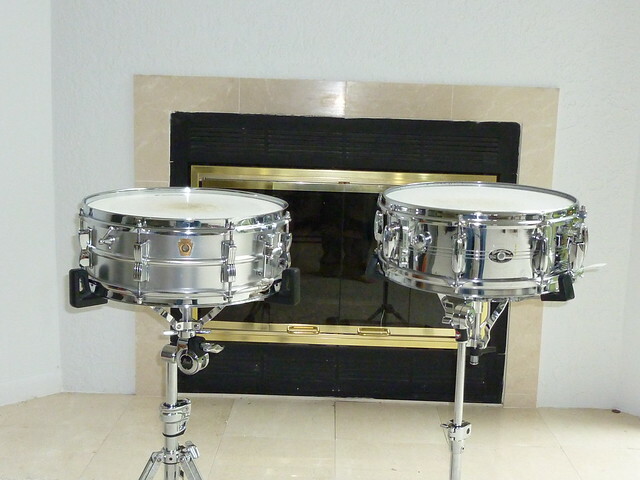 Has anyone else here been down the path of using a marching snare on their kits? Zounds Perspex wrote: cool drums, everyone! here are mine. these belong to my good friend. 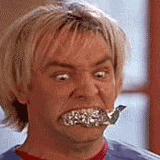 I play in a band with him. They sound amazing! Sick kit josh!!! And sick Matamp too!! jumbo_steelie wrote: Sick kit josh!!! And sick Matamp too!! 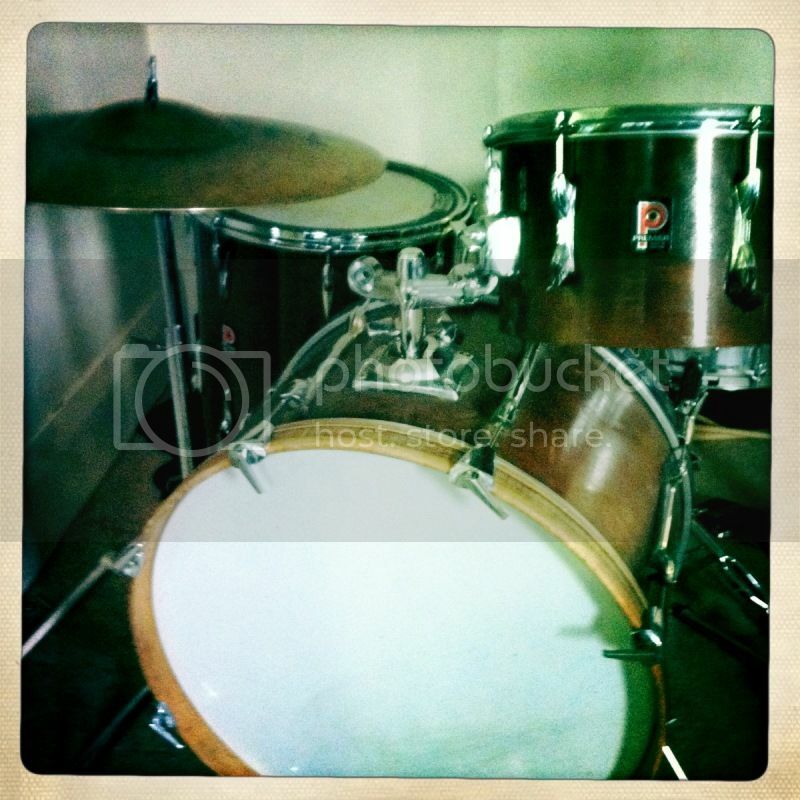 I really seriously want to take up drumming. 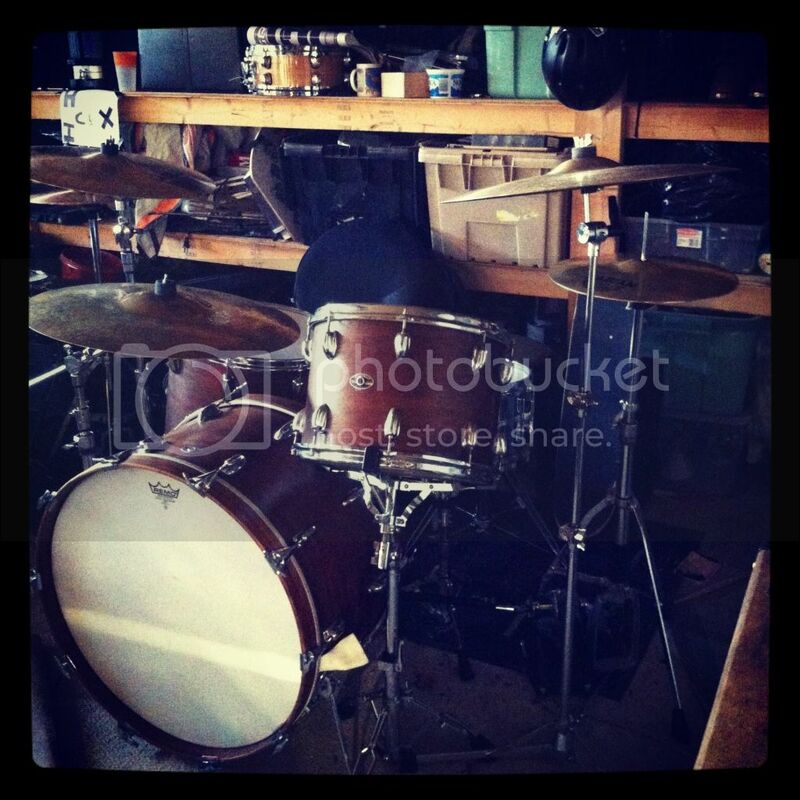 I missed out on a Ludwig Vistalite set in Tequila Sunrise for $400, and I've been kicking myself since then. What brands are good to look out for on the used market. I don't have a ton of money, but should have a bit in a few months. I'm just looking for something decent and playable. Ideas? I like big drums. Schlatte wrote: Yaaay! Finally a Drums thread! custom OCDP vented snare 14x06"
Reminds me of my buddies kit. Sounded killer back in the day! I bet this one does too. 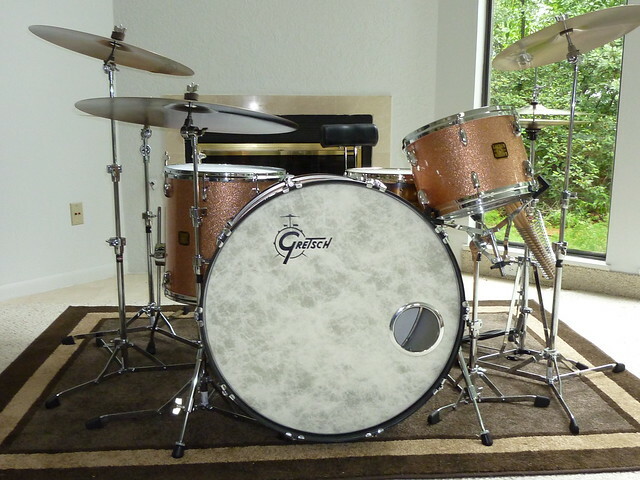 Also that Gretsch kit is one of the best I have ever seen Zounds, you have such good taste in everything. IEatCats wrote: That dude needs a beard and a sad demeanor.